Within a day of taking the notes, the student should revise and write questions and then write an overview in the summary at the bottom of the page. This helps to increase comprehension of the topic. 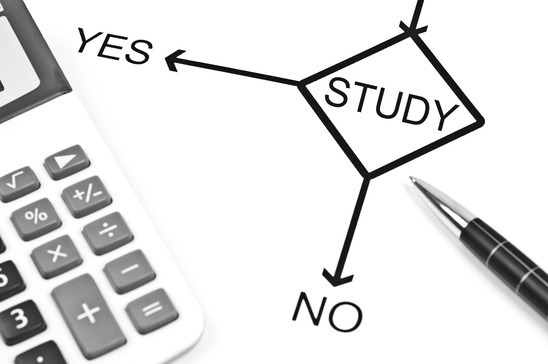 When studying for either a test or quiz, the student has a concise but detailed and relevant record of the material. 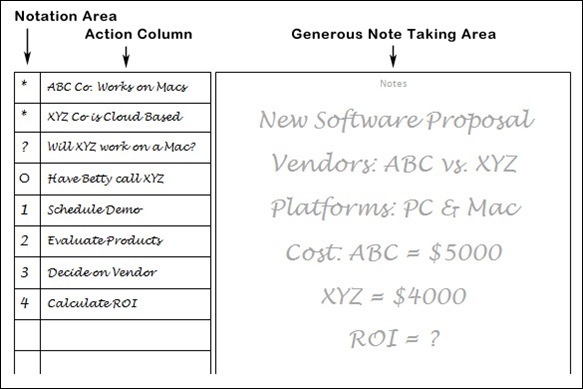 I’ve taken the basic Cornell idea and expanded on it. 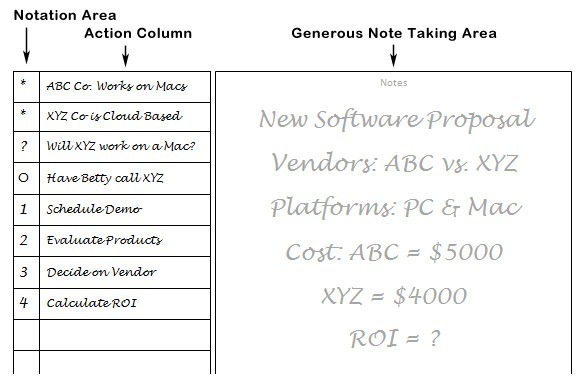 For this Note Taking Worksheet, I’ve added markup notation which is listed at the bottom of the document for easy reference. 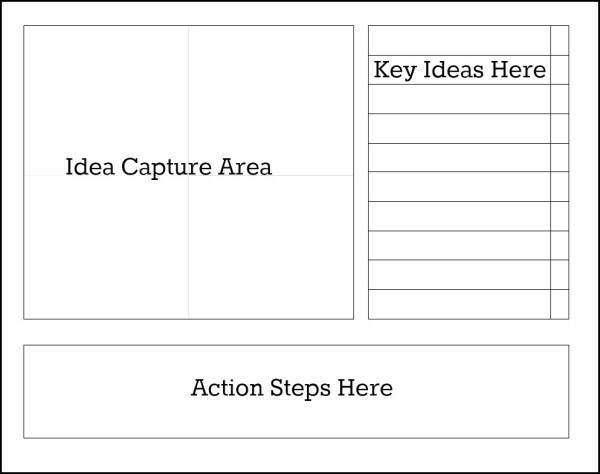 At the bottom of the document is a summary area, where you summarize your action steps and come to a conclusion. 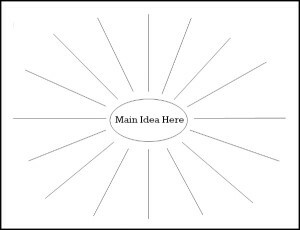 Writing this in the summary box gives you a complete project roundup which can be filed away or three hole punched and kept in a notebook for further reference. 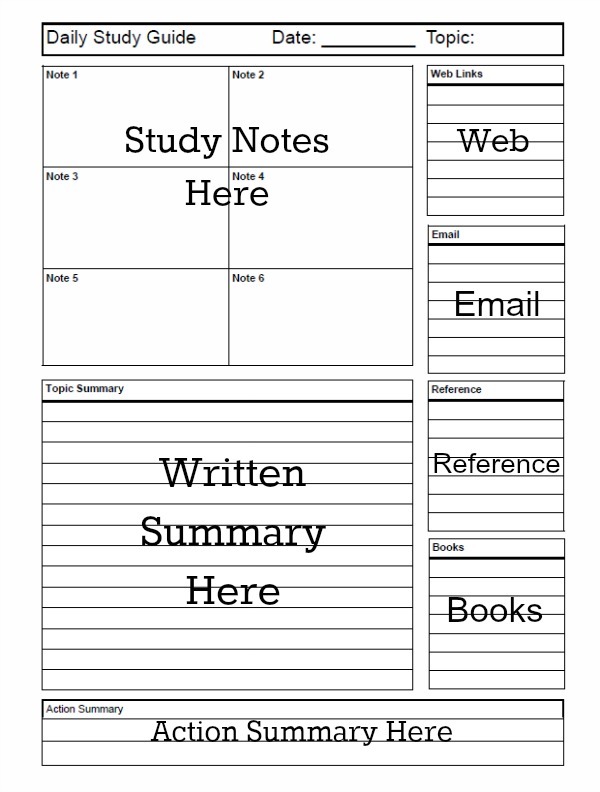 Now that you have captured ideas and taken extensive notes, it can be helpful to create a daily study guide. This allows you to create action steps, record links to web sites, make phone calls and pick up any reference books or materials as needed. Here is what it looks like. When you are actively working on a project, our daily study guide can help you summarize multiple notes into one concise document. Built around our daily planner, the boxes have been modified to accept study notes. This make s a great follow up to our Cornell style note taker. Now that you have your notes collected, sorted out, and action items written it’s time to concentrate. The best way to do this is to implement our 48-minute focused time system. Simply this is a way to divide an hour up 80/20. You block out all distractions and do one task for 48 minutes and then take a 12-minute break. Repeat as necessary. The beauty of it is its simplicity. Using this single-tasking idea you can get a lot more studying done in a shorter amount of time. By turning off distractions including your e-mail, phone, and any browsers you may have open, you simply set a timer for 48 minutes and begin. The really cool thing about a 48 minute period is that it can be divided in many different ways. You can do two projects in that time at 24 minutes each, three projects at 16 minutes, four projects at 12 minutes and eight projects at 6 minutes. The 48-minute worksheets allow you to plot individual study ideas or sessions into separate time periods. Combining worksheets can allow you to capture notes, information and understand the big picture. 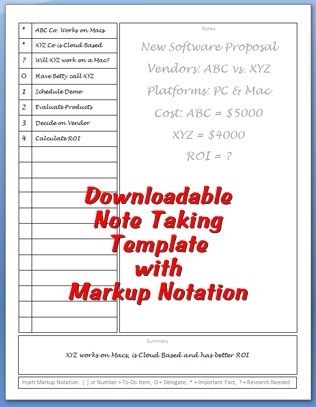 Be sure to download and use our free note taking worksheets for your next project, meeting, or seminar. Learn how to study effectively today.